And what he meant by that was that if a copywriter mentally heard his prospective audience say “yeah, sure” every time a claim was made, he’d end up substantiating his claims and closing the loopholes on his offers, thereby writing far stronger, more persuasive copy. Ok, so what do you think: does this trip the too good to be true warning? Absolutely! 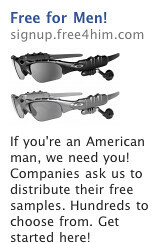 I’m already thinking “yeah, sure” in that even though they’re showing a picture of High-end Oakley Sun Glasses, they’re actually sending out sample packs of, like, shaving cream or something. So what might help build credibility or substantiate the claimed offer? Well, the “hundreds to choose from” that the ad text already has helps a bit, though it could be stronger, since one concern the prospect may have is that he innocently signs up to beta test free stuff and then has to explain to his wife why these plain brown paper wrapper items have embarrassingly started spamming his door step. So the “to choose from” is good, but it doesn’t highlight the sense of control that’s really needed to reassure the prospect. Plus, it hardly helps build credibility for the “free stuff” claim to begin with. Why not something more along the lines of “Receive only items and categories you select – over 432,000 items already sent out to thousands of men”? Do you see how the specific number helps convey that this is a legitimate, ongoing operation, while the “receive only” wording conveys greater control for the participants? Since when did a hero shot of a Gen-Xer 3 stooges help to build credibility? Is that really the best picture they could have used? And what about having an “About Us” page? This is definitely a situation where showing off the company headquarters or bios of the company founders would help immensely in creating greater credibility for both the company and the offer. What else? How about a privacy statement near the sign-up form? Just a little something to let us know that these guys are more interested in collecting money from their corporate clients than in selling our personal information to advertisers. And while the logos for the “recent offers” is good, it would be even better to show specifically what the free samples or products where that the participating ‘testers’ received. And better still if they had a separate page to showcase all of their clients. 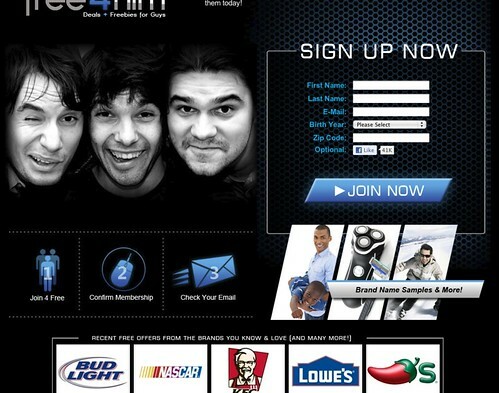 My guess is that these guys get a low click-through rate and an even lower conversion rate. Not enough credibility. But don’t make the mistake of thinking that this problem just effects the bozos or the shady dealers of the marketing world. It happens to just about everyone. So what’s the problem here? I mean a free rental isn’t too good to be true, is it? And it seems a reasonable gift for… what do they want me to do again? And there’s the rub! 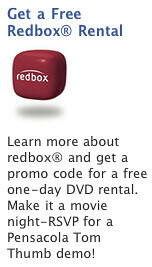 Because Redbox isn’t clear on what I have to do to earn that free movie rental, I’m wary about clicking through. Just “Learn more” about Redbox and I get a free rental? “Yeah, sure” – it’s probably some painful 30 minute preso with a “did you really read it” quiz at the end. Why not specify that it only entails watching a 90 second video? Or filling out a 30-second form? Reassure me that it’s not a painful 10 or 30 minutes of my life that I’ll be trading for a lousy $3 rental that I could just as easily download from iTunes or possibly watch for free on Amazon or Netflix. So take a cue from Gary and think “Yeah, sure” as you’re creating your next Facebook ad and watch your CTR rates soar.